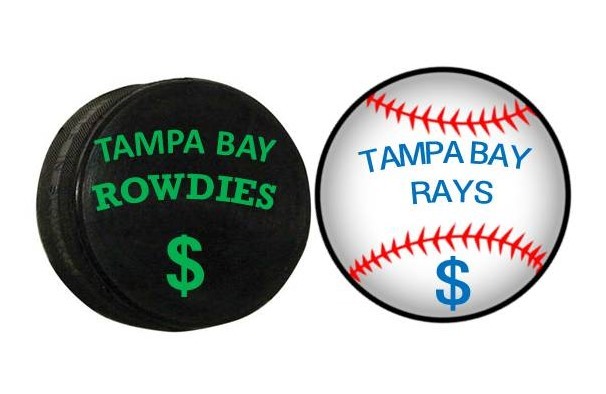 Eye On Tampa Bay: The Battle for Major League Sports Support and dollars heats up. The Battle for Major League Sports Support and dollars heats up. Bill Edwards and Rick Baker – A powerhouse team looking to make the Rowdies St. Petersburg's premier major league sports franchise. "First, back the Rowdies in its current effort to bump up from the fading NASL to the MLS tier of soccer. Edwards and his as yet unidentified ownership group will submit their MLS application Monday, Jan. 30, just ahead of the end-of month deadline for all interested MLS bidders. Second, commit to Rowdies season tickets as a tangible sign of support for an MLS team in St. Petersburg. Barring that, sign a letter of support to accompany the MLS application. Third, buy tickets for and support the upcoming "Rowdies Suncoast Invitational" later in February. It features five MLS soccer clubs playing at Al Lang Stadium, the Rowdies home field. It's the second year for the invitational. And, as Edwards told the chamber crowd, MLS officials will be watching attendance to gauge how bullish the bay area is for soccer." Best of all, Edwards says he will pay for the new stadium, priced at up to $80 million. In a bigger world of pro sports teams and owners clamoring for public funding for new stadiums, that makes the Edwards' offer all the more compelling. 4. Build a new Stadium that the Rowdies (Bill Edwards) will pay for. If the form looks vaguely familiar, check out the Baker Plan of former St. Pete Mayor Rick Baker. The comparison here is not necessarily the substance but the form. Each plan has four achievable action points that are easily grasped. Baker knows how to put a plan together, define it so people understand and execute the plan. It is quite possible that as the Tampa Bay Rays continue their dance for new stadium, the Tampa Bay Rowdies may become the next big thing in St. Petersburg. With Bill Edwards and Rick Baker driving the train, now is the time to get on board with the Rowdies. If you want to be part of the Rowdies Plan, click here Tampa Bay Rowdies and get in the game.